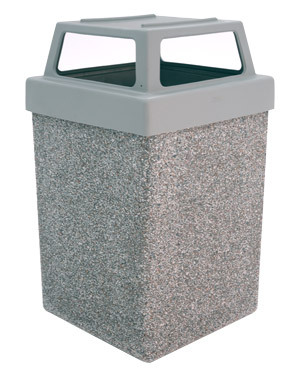 The classic style of this large 53 gallon concrete trash receptacle is perfect for high traffic areas and features the ideal capacity for any area that expects an abundance of garbage and waste materials. These trash receptacles are the answer for long lasting durability and attractive trash collection and waste management. This high volume concrete trash receptacle is reinforced with 3/8" steel rebar and meets all ASTM concrete standards. These trash receptacles are available in a multitude of finishes and color styles. Customize this trash receptacle to enhance and match your surroundings. The four-way lid on this high volume trash receptacle has raised plastic guides for any commercial foodservice tray collection. The guides allow trays to be neatly stacked on top of the unit without sliding off either side.